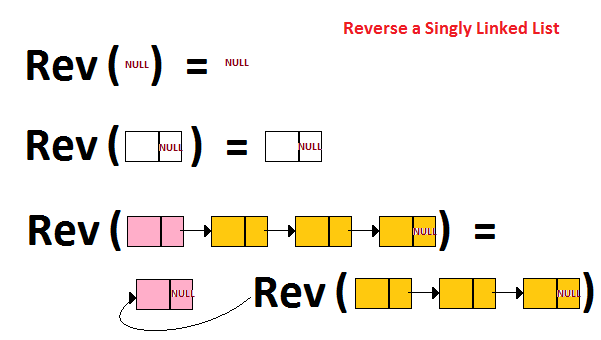 We have already seen how to reverse a singly linked list with illustrative pictures. Now lets see how we can do it recursively. In the previous problem we did it iteratively, now we shall do it recursively. To attack any problem in a recursive approach, we need to be very clear about the end/boundary conditions. For a linked list, reverse of a null list or reverse of list of size 1 is going to be the same. Reverse of a linked list of size x will be the reverse of the 'next' element followed by first. A picture means a thousand words. So, here is what happens internally. Valuable! Concise and great graph illustration! Thanks for your good work! Good to see that it helped you!! Reverse can be done this way too..
@gen: Thanks for your feedback! Your code is more simpler and neater..
your code although is reversing the list, its returning the tail pointer of the reversed list. Their is no way to access its head. Good catch dude - i have the same opinion as you - but here's a fix.